My Meeting With Madame President and My Thoughts on Ocrevus – it's only a bruise. Speaking of fundraising, it’s that time of year again and I’m excited to be walking alongside fellow MSers and our allies for the fourth year in a row! We have just under a month and about $2,800 to go! Year after year, you’ve helped me obliterate my goal for WALK MS—please consider helping me smash it again this year. Every dollar truly makes a difference in research and treatment options for people living with multiple sclerosis (like me!). We’ve seen the results of this recently, when the FDA approved the first drug ever to treat primary progressive multiple sclerosis (!!!) and that has also been shown to stop the disease in people with relapsing-remitting multiple sclerosis (!!!). That’s a huge victory for all of us and is a result of your support. Also! Do you own a small business? I’m looking for sponsors by Friday, April 14—please contact me for info! I also am seeking sponsors for this year’s team t-shirts! From the bottom of my heart, thank you for supporting me. Hey! I’m on Facebook, Twitter, Instagram, and YouTube. Follow me for updates and musings between blog postings! 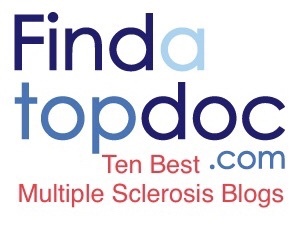 You can also read articles I’ve written for the National Multiple Sclerosis Society here! We all hope that the direction we are going in is an easy-2-use, effective and affordable (?) treatment that keeps MS under control. Is Ocrelizumab the answer, or the start of the answer?